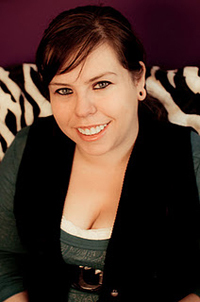 Born in Austin Minnesota, where she still lives, Amanda Hocking is a highly successful author of paranormal romance novels for young adults. She first began writing in her spare time, eventually deciding to self-publish her books, including the My Blood Approves series of vampire romances and the Trylle trilogy in which the seventeen-year-old Wendy discovers supernatural abilities and enters a world of magic, mystery, and romance. With sales of over a million copies in the first year, she soon attracted attention from conventional publishers both in her native America and in Britain. Film rights have also been optioned for the Trylle series. She has also published two books in the Hollows zombie series and Virtue, a young adult fairy tale. At least four books are planned in her new Watersong paranormal romance series, with the first due to be published in late 2012. With the first in the Trylle series, Switched, now published in the UK (Torn follows in March and Ascend in April), Amanda spoke exclusively to Foyles about listening to her readers, the perils of happy endings and why trolls have more in common with humans than you might think. Trolls have been very lucky for you. Are there any personal superstitions you follow when you're writing? My only ritual before writing is drinking a lot of Red Bull. You are incredibly prolific with your novels; what's your motivation? Obviously you have deadlines now, so what keeps you going? My motivation is always the story itself. I get very excited about writing. The only way I can describe how it feels to me, is like when you first meet someone, and you start dating them, and get to really like them, to the point where you can stay up till five just talking to them on the phone about nothing, and then still get up at eight and go to work, and not be tired because you are so excited, its that kind of euphoric intensity that keeps you going. If I stop writing for a couple of days it is really hard for me to get back into it, so I try to keep going, and just run on that euphoria. The popularity of your first e-book was widely attributed to its low price, but obviously the story had caught the public's imagination, and online word of mouth would have played its part. Knowing how savvy and selective the book blogging community is was their approval ever a concern to you? When I wrote Switched I didn't know there was a book blogging community, so I just wrote the story for myself because it was something I wanted to do, but especially now when it comes to the other books I am writing I read the blogs and listen to what they are saying, sometimes the things they complain about are issues that would not have necessarily occurred to me. One thing that I am hearing from the bloggers, not all of them, is about authors moving away from love triangles as a plot device, and I think that's something, even though there is a bit of one in the Trylle trilogy, that I would like to move away from, and not really work with again. So part of that decision is to do with the bloggers, so yeah their opinions are important to me. And you have actually said in one of your other interviews, that you rely on your readership and fans to tell you about any issues with your novels, in theory asking them to be your editors, which is really a brave thing to do for an author, as the readers can be the harshest critics. Yes. I mean it is a fine balance between understanding my readers, and keeping them happy by giving them what they want, but I can't cater to all of them, because even when five people read the same book their reactions and opinions will all be different, so I am never going to be able to give every reader exactly what they want. But I do listen to them and take their feedback into consideration, but in the end I have to write something that is true to me, and that may be contrary to their thoughts, but I have found that most of the time its not. You obviously love myths, legends and fairy tales, and many classic elements from such tales run through your novel Switched. What stories do you find yourself going to for inspiration? I try to stay clear of tales that are really common such as Cinderella or Snow White. I like tales that have an edge, and are a bit darker, that don't always have a happy or easy ending. I like the Grimm fairy tales, the original ones, I have a book of them at home. In fact the other day I was arguing with Eric about stories end, because I had said 'You do know the endings to the stories are actually really horrible' and he just would not believe me, so I had to pull out the book and show him that they really are horrible, and the stories we know now have all been Disneyfied everything has a Hollywood happy ending. Don't get me wrong, I like a happy ending, but I think there has to be a sacrifice or a price paid and a lesson learned, otherwise it's too easy. I got the sense from your novel that it was more a 'what if' retelling of classic fairy tales in that what if she fell in love with the huntsman. What if Wendy was raised by the evil queen and the damsel in distress in fact rescues the lost prince. With the Trylle series did you want to create more of a modern fairy tale as opposed to your average paranormal romance? I guess I did. I wanted to bring in different elements from classic tales. One of the things that really inspired me was the film Labyrinth you can see when you're watching it all the different stories brought into it, and I just love the way he (Jim Henson) created an entirely new and different story. I really wanted to do that in my own story to play with ideals and conventions and create something new. The romance between Wendy and Finn has many obstacles, as all good young adult paranormal novels do, but the things that separate them are class and duty. What inspired you to look at the relationship from this angle? Growing up I knew people whose relationships had been affected because of social differences, things that are going on in culture all around us even now. Many people are still looked down upon for who they are going out with, or who they are friends with, and more often than not, it actually has nothing to do with sexual orientation or ethnicity it is down to the fact that there is still a class distinction in society. People are judged for coming from a poor neighbourhood or considered living on the bad side of the tracks, and who they are as individuals is not taken into account. It's an issue that interest me and is a recurring theme that features in the other two books in the series. The story also has a level of social commentary, in that you have these beings who are of nature themselves, who have lost their connection to the earth and have been caught up in technology and material possessions. Was this your intention? Yes that was part of it. I looked at things in a logical way in that in classic stories trolls are portrayed as greedy, so it was easy for me to take that, and envisage these creatures gradually giving in to wanting more things and the latest technologies and its easy to compare it to society today where, we as people, are exposed to an excessive consumer culture, and like the trolls we have gradually lost touch with who we are with regards to the world around us. Needless to say your personal story gives hope to the many struggling and unpublished authors out there to keep going, is there any advice you would give to those wishing to replicate your success? If you want to be a writer, it's not enough to be passionate about writing or wanting to be a writer. It's hard work and you have to put in the time, treat it as a career and take it seriously. Also you have to do your research, and I don't just mean ideas for your writing, but looking at all aspects of publishing from the roles of an agent, to an editor and a publicist, everything because until you get an idea of the publishing world you're not going to understand what is to be expected, or why certain things need to happen with regards to getting published, and staying published. You have been called the next Stephanie Meyer, and J K Rowling, and have been lauded as changing the publishing world. Do you worry that people are more interested in these aspects rather than in the book itself? Well, I get why people are interested: my story is unique so people will want to hear about it. Right now I am going along with it and taking it for what it is. Hopefully with my other books people will become more interested in my writing, and the stories I'm telling, and such things as how I got published, and the comparisons with other authors will eventually become anecdotal. People have often said that e-books will be the death of the book, but with YA fiction seems to a genre that is refusing to fall in line with this trend, and as shown with the publication of your books, the market for the printed format is still there. Why do you think this is? The e-book is not the death of books, there will always be a place for books they are an immediate source of entertainment, and easy to just pick up and read for everyone. You don't have to use specific technology to access a book or wait for downloads or loose things through corrupted files, you just open the pages and read. Also with a book, you don't have to worry about leaving it somewhere or if it gets damaged, because they are easy to replace. The printed word will never become outdated. So having your book published in printed format does it make you feel more like an author now, do you feel like you are getting a happy ending to your own fairy tale? It feels good, I am really glad that people are buying the book, although I don't think it makes me think of myself as more of an author, because I still don't feel like an author, I feel like I'm playing pretend. Getting my book published in physical format, and the positive response... I mean, all of this is just icing on the cake.